Five years ago, Olivia Allen ’13 was taking photos for Simpson Res­i­dence during home­coming week and snapping photos on the side­lines at football games. Today, Olivia and her husband Jonathan are full time mis­sion­aries for Youth With a Mission in Paris, France. While she was a student at Hillsdale, Olivia was on a pre-med track and studied bio­chem­istry. 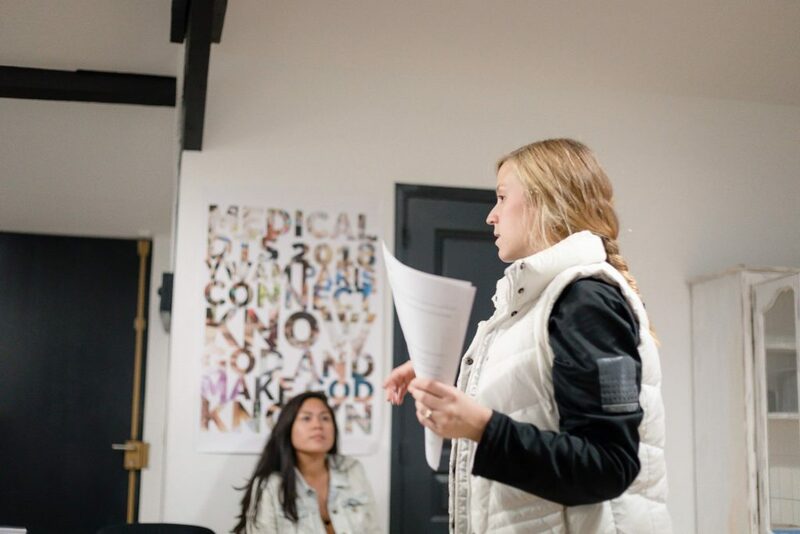 Now, Olivia uses her back­ground in science to serve those in Paris through a medical min­istry, YWAM Paris Connect. Olivia said she realized she had a heart for serving God through mis­sions when she was very young. In middle school, she went on a mis­sions trip in the Bahamas and saw firsthand the depra­vation and impov­er­ishment within the country. Before Olivia com­mitted her life to full-time mis­sions, she was part of the youth program at Hillsdale Free Methodist Church while she was a Hillsdale student. Olivia said she encourages current stu­dents to step outside their comfort zones and help those in the com­munity. “We’re missing out on the mission field right there. Espe­cially if you’re called to mis­sions, it’s there,” Olivia said. Dave Turner, the youth pastor of Hillsdale Free Methodist Church, said Olivia was an out­going and com­pas­sionate woman who was a cre­ative thinker in terms of her approach to mis­sions. He said she would often­times serve children from broken homes outside of the church walls. “She was here for school, but she was on mission to make a dif­ference. She just had that kind of drive about her,” Turner said. When she wasn’t serving in the com­munity, Olivia said she spent most of her time with friends as a Hillsdale student. She credits her friends at Hillsdale for preparing her for the work she is doing in Paris. “By having so many dif­ferent friends, with so many dif­ferent faith back­grounds, here, I’m able to be more open and be more willing to not let God be in a box,” Olivia said. Olivia said she was friends with people from all dif­ferent types of social groups, including the head res­ident assistant of Simpson at the time, Garrett Holt ’14. According to Olivia, one of her most mem­o­rable expe­ri­ences at Hillsdale was climbing on the roof of Mossey Library to take a picture of res­i­dents in Simpson for the 2013 home­coming com­pe­tition. While on the roof, Olivia snapped a quick photo of Holt, who was wearing a bright red suit. A bright blue sky with clouds and Central Hall filled the back­ground. Holt said he did not know Olivia had taken the photo. He and other Simpson res­i­dents saw it for the first time pro­jected on the wall of Simpson. “It was really hilarious because I had not seen it or known about it, and everyone just kinda freaked out when we saw it,” Holt said. Olivia said Hillsdale pre­pared her for her future by making her teachable. After grad­u­ating, Olivia moved to Col­orado and taught for one year at James Irwin Charter High School in Col­orado Springs. Upon moving to Col­orado, Olivia met her husband, Jonathan, whose cousin attended Hillsdale College. YWAM was founded by Loren and Darlene Cun­ningham in 1960. It is a global movement of Chris­tians ded­i­cated to knowing God and making him known. Olivia said the main goal of YWAM is evan­gelism, or talking about Jesus with others. Before becoming full time staff for YWAM, Olivia said she and Jonathan had to com­plete YWAM’s Dis­ci­pleship Training School. Olivia said there are many dif­ferent types of DTS, and each one is broken up into weeks focused on teaching stu­dents dif­ferent con­cepts about being in the right rela­tionship. Examples of DTS pro­grams include medical, sports, music, and writing. Olivia said each DTS is designed to equip people with skills to respond to their callings from God. She and Jonathan com­pleted a medical DTS together. They spent three months in Perth, Aus­tralia training and then another three months in Manila, Philip­pines doing out­reach. After com­pleting their DTS, Olivia said she and Jonathan wanted to stop in another city on their way back to the United States. She said flights through Paris were the same price as flying straight home, so they decided to stop at the new YWAM base in Paris. In Feb­ruary 2018, Olivia and Jonathan decided applied for a staff position at the Paris base. In March, she said they were both accepted and made plans to move. Olivia and Jonathan made Belleville, Paris their new home on Aug. 28 and joined the medical DTS staff. As staff for the medical DTS, Olivia said she goes out into the sur­rounding com­mu­nities and pro­vides basic healthcare for those in need. She said the clinics often turn into therapy ses­sions, as the people she serves will share how they are hurting spir­i­tually or emo­tionally. Olivia said the goal of her work is to share the gospel with others but also transform com­mu­nities’ health stan­dards. Olivia said most of the people she works with do not have an edu­cation level above kinder­garten. She and the staff perform skits and songs to make it easier for those they are serving to remember. According to Olivia, the Paris base is focused on serving Europe and the 10 – 40 area, which includes North Africa, the Middle East, and Asia approx­i­mately between 10 degrees north and 40 degrees north lat­itude. Jonathan Allen said the base leaders in Paris have a vision to become a mis­sions campus that trains people in all areas and sends them out follow their call from God. Olivia and Jonathan each have their own goals for their future in mis­sions work. Olivia said she hopes to teach the week of DTS devoted to repen­tance and for­giveness. Jonathan said he hopes to lead a DTS of his own and be the spir­itual head of that school. “I’d love to teach inter­na­tionally, bases all around the world, but it’ll start here,” Jonathan said. Olivia and Jonathan both said they hope to encourage people, specif­i­cally men, who are pas­sionate about mis­sions to pursue that love for serving God, through a sep­arate orga­ni­zation.